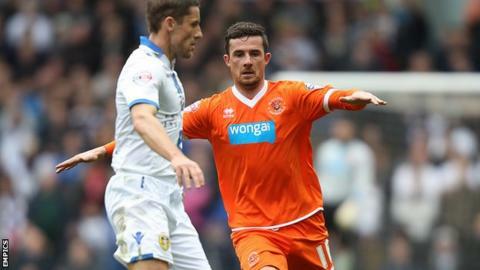 Barry Ferguson says he will "do whatever it takes" to keep Blackpool in the Championship after making a playing return in Saturday's defeat at Leeds. The 36-year-old appeared for the first time since taking temporary control of the Seasiders in January. Ferguson has been struggling with an ankle problem but came through a full 90 minutes at Elland Road. "The staff had a chat about it and I asked a few of the players, and they wanted me to at least try," he said. "It's a fight and I don't shy away from a fight, so I'm going to be here until we get those points on the board," the former Scotland captain told BBC Radio Lancashire. "I need to do whatever's best for Blackpool. If that means I go out there to help the boys, I'll do that. I'll do whatever it takes. I've done things like that in the past and I'm willing to do it again." Saturday's 2-0 loss, which left Blackpool two points above the relegation zone, ended a turbulent week for the club. Home defeats by Yeovil and Derby prompted the Blackpool Supporters' Association to send a letter to the playing squad questioning their commitment and pride. "Everybody stuck together," added Ferguson. "There was no question of the commitment or pride. There was a lack of quality in the last third, but I'm sure that with some hard work this week, we'll get that."